At many mines, training for new hires doesn’t get as much attention as it should. This integrated, building-block approach to adult learning and big-picture focus offers a cost-effective solution to the problem. Too often, haul-truck operator trainees don’t retain enough of the knowledge they learn during training. This can lead to longer on-boarding cycles, lower productivity and potential safety problems in the mine. Blended learning, a technique that provides training via multiple modalities using a highly structured, building-block approach, has shown a lot of promise in addressing this challenge. Insights gathered over a three-year period from mines in North America readily support this notion. In recent years, a number of trends have converged that are creating major challenges for mines worldwide. Experienced operators are retiring, taking with them a wealth of operating experience and knowledge. Fewer qualified candidates are available to replace them. As mining companies look farther afield for new operators, they find a growing percentage of new haul-truck operator trainees have no previous experience operating heavy machinery. Driving a haul truck is often an entry-level position in many mining operations. As such, it presents a real opportunity to set the stage for a safety culture and inculcate new operators into a safety first mentality. Computer-based training alone is not an effective method for training equipment operators. Because a large amount of knowledge is transferred to trainees in the form of a “mind dump,” they have difficulty retaining what they have learned when they transition to field training. That, in turn, can lead to longer on-boarding cycles, as well as procedure and safety concerns. Field training at many mines isn’t as structured as it needs to be. Typically, haul-truck operator trainees ride along with experienced operators for a prescribed number of hours. This approach is intended to give trainees practice operating a haul truck on a supervised basis. It’s also an ideal opportunity for trainees to observe experienced operators in action, so they can model their work practices. But all too often, it’s up to the experienced operator to decide how much, or how little, knowledge is conveyed during these ride-alongs. At best, operator training is inconsistent; in the worst case, bad habits or inaccurate and unsafe practices are passed on to the new hire, which are difficult to correct. In many mines, checklists are used to assess whether a trainee is ready to begin independent operation. But too often, they are brief and superficial—and don’t serve as accurate indicators of a trainee’s readiness for independent operation. When they are operating in a production loop with other haul trucks, these “weak links” can slow down everyone else, causing a significant drain on a mine’s productivity. 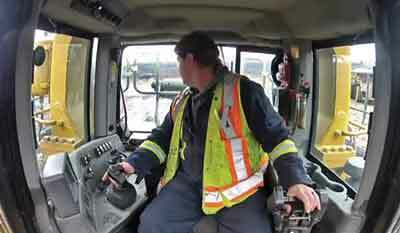 Haul-truck operator training in many mines is very equipment focused. Trainees learn about operator controls, how to conduct a pre-use inspection, and learn far less about how to perform critical tasks safely and efficiently. Trainees never get a sense of the bigger picture—how the work they perform contributes to the bottom line of the mine, or how to interact effectively with other equipment operators and the mine’s dispatcher. These represent significant, unrealized opportunities for performance and productivity improvement at many mines. Before—The existing computer-based training program was more than 400 screens of material, delivered in a “brain dump” to trainees. More than 200 screens were devoted to the pre-use inspection and machine controls, leaving just 200 screens to teach the tasks of haul-truck operation. There was no sense of what the foundational building blocks of knowledge were; nor was there a step-by-step process to build trainees’ skills and knowledge incrementally. After—The new training curriculum makes extensive usage of skill and knowledge “chunking” based on key tasks. A building block approach is employed. Trainees begin with and have time to master simple, foundational concepts before moving on to more complex tasks. More time is spent on critical tasks, such as approaching dump sites safely and positioning trucks at the shovel. After—Checklists in the new curriculum are skill and task specific and much more detailed. They provide the coach with a more accurate picture of trainee competence and readiness for independent operation. They also make it far easier for handoffs from one coach to another. The new coach knows where the old coach left off, and can readily tailor his or her coaching to the individual trainee. Before—On-the-job field training was inconsistent; it left the individual coach to determine what trainees needed to know. There was inconsistency between field trainers, which means one trainee would not necessarily have the same basic coaching experience that another trainee had. After—Structured on-the-job activities are designed to integrate with the CBT lessons and simulator sessions. Immediately following introductory lessons in each module, trainees ride with their coach and complete an observation worksheet. These sheets include questions they must ask the coach that relate to the topics they learned about in the CBT lessons. Questions serve as “ice breakers,” or catalysts to begin the coaching conversation. Before—Coaches were provided minimal training in how to effectively share their experience and knowledge. • Provides trainee with a full account of steps taken along with insights into the decisions trainee has made along the way. • Models this behavior for the trainee, who is expected to “talk out loud” and narrate when performing the same task. This approach allows the trainer to be far more effective in transferring their experience. When trainees talk out loud, it gives the coach the opportunity to “coach in the moment.” It is also much safer, as the coach can correct a potentially unsafe practice before it can occur. Before—Coaches were not trained on the specific information to share with trainees or the most effective practices for doing so. In the absence of job aids, some coaches created their own training tools. For example, one coach diagramed the shovel pit, to help trainees visualize the potential paths to the shovel and how to select the one that is safest and most productive. Another coach parked the truck on the perimeter of the shovel pit and narrated what each truck operator was doing and why. There was no formalized program for sharing these excellent tools and techniques with other coaches and ultimately the trainees. After—Coaches participate in a two-day train-the-trainer session where they experience the entire curriculum. During post-program interviews with coaches, several of them admitted they had learned new things. It also gave them a better idea of what they needed to support in the field. Over time, supervisors and dispatchers were also trained, so they could understand what trainees were learning and likewise do a better job of supporting it. Before—Performance data was not provided to coaches to help them understand where each trainee needed help. After—Data from the CBTs’ “check your knowledge” questions and simulator sessions is shared with coaches. This helps them understand where each trainee needs additional coaching. Operational challenges often increase when the new operator’s initial training is inadequate. Typical operational problems with haul trucks include speeding on grades, overuse of service brakes, incidents with shovel counterweights, speeding in unsafe weather conditions, and increased truck maintenance due to operators not monitoring gauges and not operating the truck within proper parameters. These improper operating practices tend to shorten component and truck life, can cause unplanned truck downtime, and may result in near hits and incidents. Too often, mine trainers address these improper operating practices after trainees become production haul-truck operators. A more effective approach is to modify training methods to produce better outcomes from the start. A potential solution to this is blended learning. Blended learning holds significant potential to address these training and operational issues by utilizing multiple training modalities to deliver training. It recognizes that adults have different learning preferences. Some people are predominantly visual learners, while others are auditory or kinesthetic (or hands-on learners). A blended learning curriculum utilizes a variety of media that address all of these learning modalities. “Check your knowledge” questions to verify that trainees have retained what they’ve learned, and provide trainers with feedback on where remediation may be required. Structured on-the-job training activities, which provide trainers with instructions for conducting exercises and activities that build trainees’ skills. These tools also provide trainers with assessment tools they need in order to provide meaningful, targeted feedback to each trainee. Job aids and performance support tools that trainees can use to maintain a high level of performance long after the training is over. Illustrations, animations and video incorporated in the computer-based training to demonstrate critical skills and operating scenarios from a variety of perspectives. Computer-based lessons that include interactive problem-solving scenarios that engage trainees and challenge them to apply what they’ve learned in realistic and challenging situations. Computer-based lessons that include experienced operators who share their knowledge and best practices during recorded video segments. Adults learn differently than children. They are much more pragmatic; they want to know why they need to know something and how they will be able to apply it. Typically, if they aren’t given opportunities to apply new knowledge immediately, they don’t want to be bothered with the training. Adults also prefer to be problem solvers. They want to know “what happens if I do this?” or “how will doing this negatively impact safety?” Finally, adults prefer hands-on activities to sitting in a classroom or consuming information in front of a computer screen. Instructional designers must consider these factors when designing training for pragmatic, practical adults. Blended learning solutions move away from the traditional “brain dump” model of training, which has been proven ineffective by numerous studies. In its place, a well-designed blended learning program substitutes a “building block” approach. Knowledge is “chunked” so that basic, foundational concepts come first and are built upon, step by step. This helps adult learners grasp, practice, and internalize the knowledge and skills they need to master to become safe and proficient operators. A blended learning methodology is applied to each task. For example, in VISTA’s TruckLogic haul-truck operator training curriculum, trainees first learn how to approach a shovel on the cab side in a computer-based training lesson. Next, they move to a PC-based simulator, where they have an opportunity to practice what they have learned in a safe, simulated mine environment. From there, they transition to a ride-along activity on a real haul truck, where they get to experience cab-side loading first-hand, in both the “jump seat” and behind the wheel of the haul truck. In short, trainees learn, observe and then perform a single task. Once they have mastered it, they move on to the next one, with a similar “learn/observe/do” cycle. Chunking the introduction of skills and knowledge allows learners time to internalize them one at a time, and results in a significant increase in trainee knowledge retention. Suncor Energy implemented VISTA’s TruckLogic as a pilot program in April 2010 at its large oil sands mine near Fort McMurray, Alberta, Canada. Opportunities were identified to improve process safety standards and increase productivity with haul-truck operator training in the learning lab and the field. The accompanying box describes the training picture there both before and after the mine implemented six basic elements of VISTA’s TruckLogic haul-truck operator training curriculum. Curriculum level: At the macro level, a curriculum like TruckLogic integrates a number of learning modalities to provide an effective learning platform for trainees. Task level: Within each task, another level of blending is employed to ensure that key knowledge on haul-truck operation is retained by the trainee, following the “learn/demonstrate/do” model previously discussed. People level: The expanded circle of people—coaches, supervisors, dispatchers and others—who became involved in supporting the TruckLogic curriculum represent a third level of blending. Each has their own key performance metrics for which they are responsible. But given the common goal of making haul-truck training more effective, they have collaborated to a surprising degree to make the program a resounding success. In many cases, the curriculum substantially changed their roles. For example, coaches were expected to do much more with trainees than just ride with them. Under the new curriculum, they were expected to “narrative coach” and share what they were thinking and doing as they demonstrated a task—not a natural act for most of them. And, they were expected to answer the questions that trainees had on their observation worksheets and complete more detailed evaluation forms. Dispatchers needed to cooperate and route trucks carrying coaches and trainees to different pits and dumps than their normal routes. Because trainees practiced skills incrementally, the coach and trainee needed to switch seats frequently, which had to be factored into the cycle times of these trucks. Level 1 – The immediate reaction of the student: What he or she thought and felt about the training. Level 2 – The learning that took place: The increase in knowledge or capability that took place as a result of the training. Level 3 – Behavior change: The extent of improvement in behavior, capability and implementation/application of the new knowledge. Level 4 – Results: The effects on the business or environment resulting from the trainee’s increased performance. Graduates of the training program, supervisors, and dispatchers were interviewed and asked what worked well and which elements of the curriculum needed to be improved. This helped Suncor’s training team and VISTA’s instructional design team identify additional enhancement opportunities. This evaluation framework still exists and can easily be adapted to assess the training programs of other mines. One of the unexpected outcomes of introducing trainers to the practice of blended learning at Suncor is that it energized them to come up with new ideas to further increase the effectiveness of the TruckLogic training program. For example, Suncor is now considering deploying whiteboards and markers to all field trainers, so they can diagram pit layouts and machine positions in much the same way as a football coach diagrams plays and the movements of each player. This tool also promises to enable trainers to run through before-and-after, “what went wrong?” and “what if we did this?” scenarios. Video footage shows trainees where the operator’s hands are positioned and how he turns his head to check for other equipment. 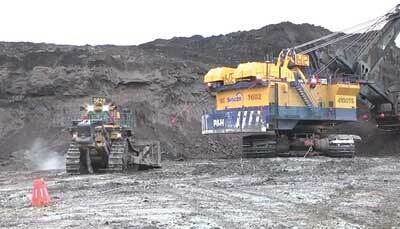 Video captures from inside the dozer provide wide angle views of what the operator is doing. Some support machines only perform certain tasks on an occasional basis, which means that the trainee may not have the opportunity to practice and learn to perform them effectively. In addition, not all of the coaches at the mine may be trained in the best practices to perform them. 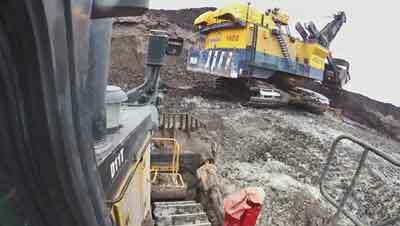 And, some support machines are engaged in potentially dangerous tasks, such as a dozer pushing material down to a shovel. To overcome these challenges, VISTA Training has developed an innovative technique that allows trainees to “ride virtually” with an experienced operator. Video of the inside and outside of the machine provides close up and wide angle views of what the operator is doing inside the cab. At the same time, a trainee is able to see the results of his actions on the machine’s components and the surrounding environment. In addition, microphones inside the cab allow the operator to “narrative coach” in real time. In the hands of a skillful instructional designer and video producer, camera footage from multiple angles is blended into a seamless whole image that helps trainees understand what the operator is doing in the cab to an unprecedented degree. Footage can be used to show where his hands are located on the controls and what he’s doing with his head (turning to check for other equipment, for example). It’s the next best thing to being in the cab. Field trainers can use small video cameras to film trainees performing a task and then they can review it afterward. This technique is ideally suited for critical tasks, infrequently performed tasks or specialized tasks that not every trainer has experience with. The best-in-class operator for each key task can be filmed and can narrate as they perform a task. Videos can then be shared with new trainees as well as experienced operators and coaches—ensuring that best practices are shared with all operators. This, in turn, can help to elevate the productivity of the entire mine. In addition, Suncor plans to order headsets that will enable the coach and trainee to communicate with each other in real time as the trainer demonstrates a task or the trainee practices for the first time. These conversations will take place on a separate communication loop, so they won’t interfere with the mine’s normal radio channels. Other potential suggestions for improving on-the-job sessions that surfaced during the four-level Kirkpatrick analysis include providing field trainers with small video cameras, which they could use to record their trainee performing a task, and together they can review his performance; using tablets and smartphones to enable trainees to “pull” knowledge when it’s needed, rather than just “pushing” massive quantities of information to them via conventional training; and providing additional diagnostic job aids—either paper or electronic—that can help new operators solve problems in the field. Some factors to keep in mind when implementing blended learning in a mine include considering the needs of the learners, determining the best delivery of the information, considering the building blocks of knowledge the operator wants to convey, and the foundational tasks that need to be learned first. Also, the implementer must be willing to experiment and adapt as they go since operational challenges, pool of potential trainees and training resources are unique. There is no one-size-fits-all solution. Also, keep in mind that blended learning is more than just an effective model of adult learning, it’s also an exercise in change management. Everyone’s roles change in this new paradigm, including that of the coaches themselves. Many have lived through numerous change initiatives, some of which have come and gone quickly without making an impact. Their initial reaction to the new blended learning program may very well be “this too shall pass.” The secret to gaining the support of coaches and trainers is to ask for their input. Give them a sense of shared “ownership” in the new program, and they’ll be much more likely to support it. The payoff for blended learning can be significant. Not only can it improve mine safety, it can also have a substantial impact on the bottom line. In its 2010 pilot of the TruckLogic haul-truck operator training curriculum, Suncor experienced a 50% reduction in incidents and a 3.5% productivity increase. Its success was due not only to its integrated approach to training, but also from the culture changes it helped to bring about. At many mines, the process of training for new hires doesn’t get as much attention as it should. It represents a unique opportunity to get trainees started out on the right foot, with a mindset of safety. Blended learning, with its integrated, building-block approach to adult learning and bigger picture focus, looks like an excellent fit with these needs. Chuck Frey is the marketing manager for VISTA Training. He can be reached at 262-514-2886 or by email at chuck@vista-training.com.